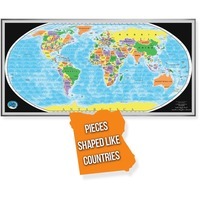 The Global Puzzle features pieces that are actually shaped like the countries of the world so you cannot complete this 600 piece puzzle without figuring out where every country is located. Build the puzzle and learn the world. Oceans are filled with fun facts about every country in alphabetical order from Afghanistan to Zimbabwe. Fun facts allow you to continue the educational experience while also serving as a guide to help you solve the challenging blue ocean pieces. Puzzle includes all the country's capitals. It is designed for children ages 8 and up.